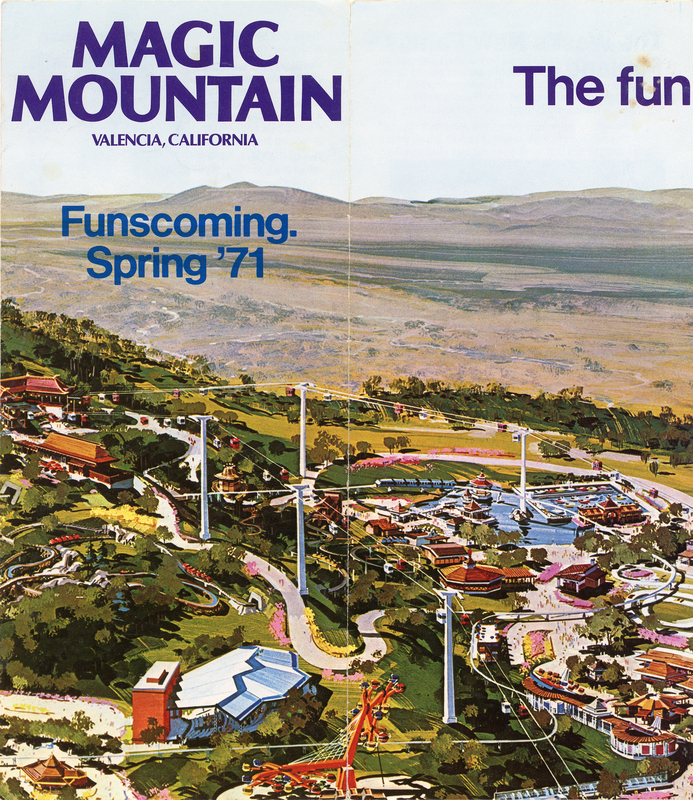 SCVHistory.com LW2863 | Valencia | Funscoming Spring 1971: Magic Mountain Pre-Opening Brochure. Pre-opening brochure (4-fold, 9x16 inches) describing The Newhall Land and Farming Co.'s new amusement park. 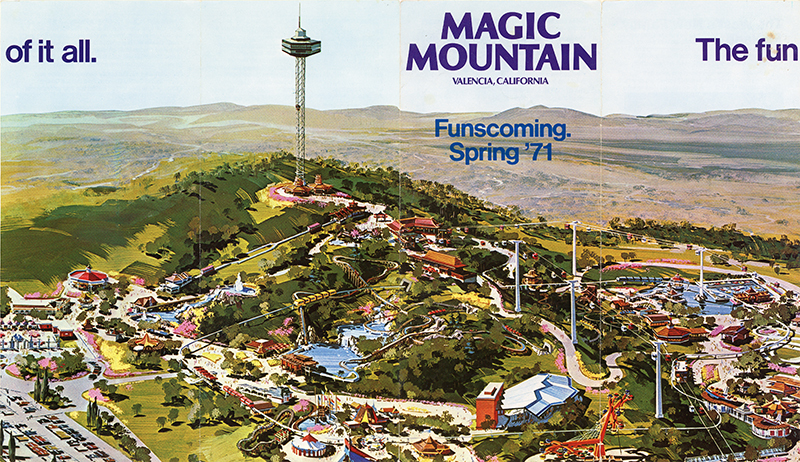 Magic Mountain opened over Memorial Day weekend in 1971. Brochure text follows. 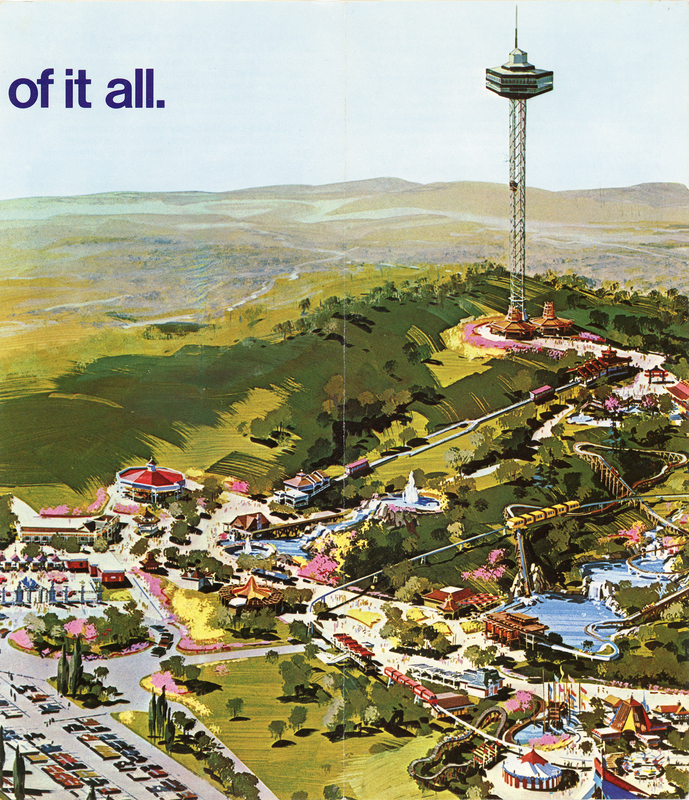 Magic Mountain, a new 200-acre family fun park is opening in the Spring of 1971. It is being developed jointly by subsidiaries of Sea World, Inc. and The Newhall Land and Farming Company. The architect is Randall Duell and Associates, creator of America's leading recreation parks. This team of experts has spared neither expense nor effort in bringing you the ultimate in comfort, convenience and sheer excitement. Lush landscaping assures cool, pleasant surroundings throughout Magic Mountain. And there will be plenty of rest areas to enjoy it all at your leisure. In fact, enjoyment is everywhere at Magic Mountain. There's parking space for more than 5,000 cars. 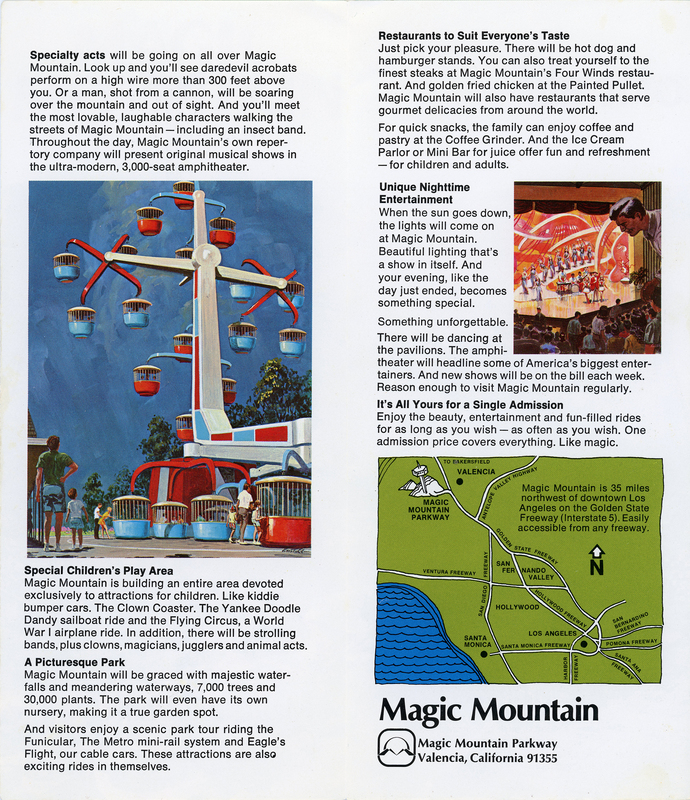 And the careful design and placement of Magic Mountain's attractions mean you won't have to stand in long lines. Put it all together, and Magic Mountain adds up to a unique concept that captures the best of two worlds: exciting rides and entertainment plus an enchanting country park. The Sky Tower will whisk visitors 365 feet above the park. At the peak of its climb, this ride will reveal a spectacular panoramic view of hills and valleys unfolding for miles. The Grand Carousel will recall the good old days for adults — and delight children with magnificent color, music and motion. The Grand Prix Ride, complete with miniature Ferrari-style race cars, will test driving skills. The Galaxy will out-do the traditional ferris wheel with one surprise after another. It tilts sideways, moves in a circle and travels up and down. El Bumpo is really a fleet of bumper boats on The Lagoon. Billy the Squid is made to order for our more daring visitors — because you're riding on a monster squid. The Gold Rusher is a roller coaster and then some. Remember those runaway mine cars in the movies? The Log Jammer is a hollowed out log — and you're in it. Sliding down a raging river — ending up with a splash in the Whitewater Lake. Crazy Barrels will really have you in a whirl. The Circus Wheel puts you in a laugh-packed spin. Bottoms Up pins visitors against the wall while the floor drops out beneath them. The Sand Blasters are dune buggy bumper cars. Specialty acts will be going on all over Magic Mountain. Look up and you'll see daredevil acrobats perform on a high wire more than 300 feet above you. Or a man, shot from a cannon, will be soaring over the mountain and out of sight. And you'll meet the most lovable, laughable characters walking the streets of Magic Mountain — including an insect band. Throughout the day, Magic Mountain's own repertory company will present original musical shows in the ultra-modern, 3,000-seat amphitheater. Magic Mountain is building an entire area devoted exclusively to attractions for children. Like kiddie bumper cars. The Clown Coaster. The Yankee Doodle Dandy sailboat ride and the Flying Circus, a World War I airplane ride. In addition, there will be strolling bands, plus clowns, magicians, jugglers and animal acts. 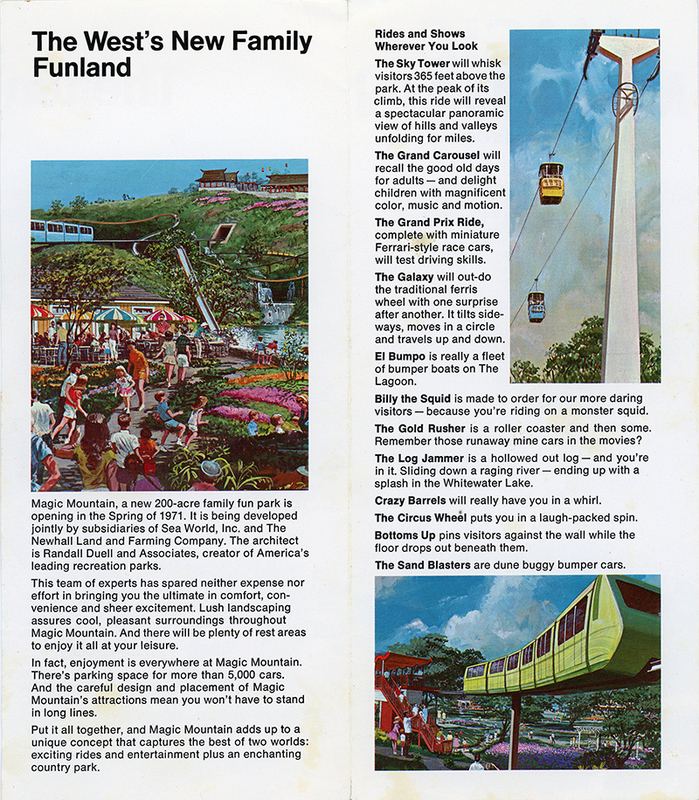 Magic Mountain will be graced with majestic waterfalls and meandering waterways, 7,000 trees and 30,000 plants. The park will even have its own nursery, making it a true garden spot. And visitors enjoy a scenic park tour riding the Funicular, The Metro mini-rail system and Eagle's Flight, our cable cars. These attractions are also exciting rides in themselves. Just pick your pleasure. There will be hot dog and hamburger stands. You can also treat yourself to the finest steaks at Magic Mountain's Four Winds restaurant. And golden fried chicken at the Painted Pullet. Magic Mountain will also have restaurants that serve gourmet delicacies from around the world. For quick snacks, the family can enjoy coffee and pastry at the Coffee Grinder. And the Ice Cream Parlor or Mini Bar for juice offer fun and refreshment — for children and adults. When the sun goes down, the lights will come on at Magic Mountain. Beautiful lighting that's a show in itself. And your evening, like the day just ended, becomes something special. There will be dancing at the pavilions. The amphitheater will headline some of America's biggest entertainers. And new shows will be on the bill each week. Reason enough to visit Magic Mountain regularly. Enjoy the beauty, entertainment and fun-filled rides for as long as you wish — as often as you wish. One admission price covers everything. Like magic. LW2863: 9600 dpi jpegs from original brochure.